This outdoor post mount light will update the exterior of your home with its eye-catching design. Featuring an oil rubbed bronze finish and clear seedy shade(s), this fixture will accommodate a variety of outdoor of dicor styles. With its easy installation and low upkeep requirements, this outdoor post mount light will not disappoint. This outdoor pier mount light will update the exterior of your home with its eye-catching design. Featuring a black finish and white seedy shade(s), this fixture will accommodate a variety of outdoor of dicor styles. With its easy installation and low upkeep requirements, this outdoor pier mount light will not disappoint. This outdoor pier mount light will update the exterior of your home with its eye-catching design. Featuring a brushed aluminum finish and clear shade(s), this fixture will accommodate a variety of outdoor of dicor styles. With its easy installation and low upkeep requirements, this outdoor pier mount light will not disappoint. This outdoor post mount light will update the exterior of your home with its eye-catching design. Featuring a silver finish and frosted shade(s), this fixture will accommodate a variety of outdoor of dicor styles. With its easy installation and low upkeep requirements, this outdoor post mount light will not disappoint. 1-Light Oil Rubbed Bronze Outdoor Post Mount Light with Clear Seedy Glass Shade This outdoor post mount light will update the exterior of your home with its eye-catching design. Featuring an oil rubbed bronze finish and clear seedy shade(s), this fixture will accommodate a variety of outdoor of dicor styles. With its easy installation and low upkeep requirements, this outdoor post mount light will not disappoint. 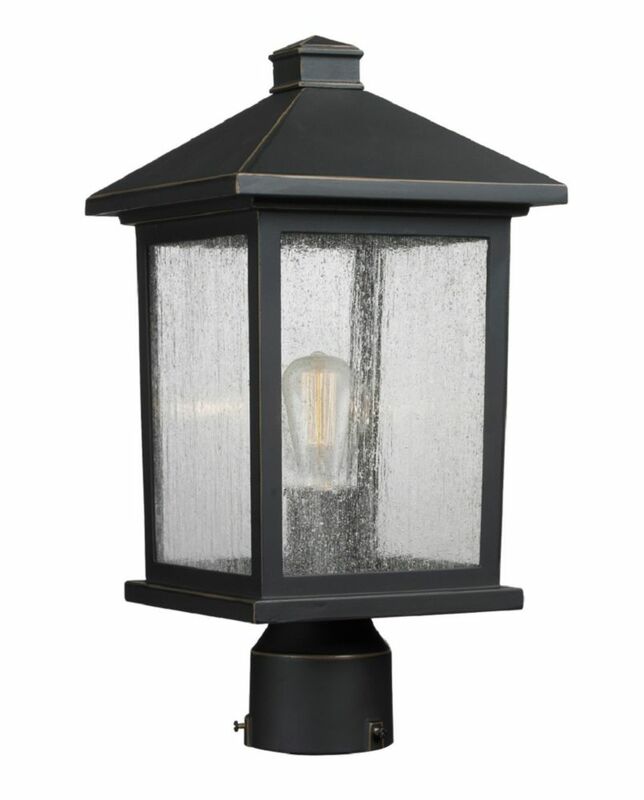 1-Light Oil Rubbed Bronze Outdoor Post Mount Light with Clear Seedy Glass Shade is rated 5.0 out of 5 by 1.